Till now, the Patidar (Patel) agitation demanding inclusion among the OBC category had been peaceful. 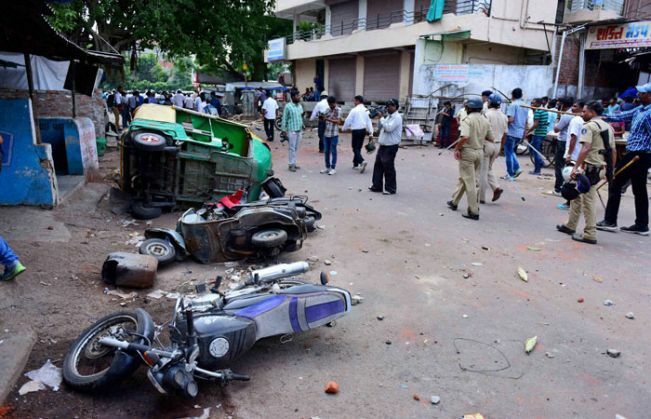 However, hours after a massive show of strength in western Ahmedabad on 25 August, things turned violent. A late evening police swoop resulted in the detention of the movement's 22-year-old leader, Hardik Patel, and his supporters. Soon after this, supporters of the Patidar Anamat (Reservation) Andolan Samiti took to the streets, shouting slogans and pelting stones at buses. They also damaged other public property in several parts of Ahmedabad, Vadodara, Rajkot and other parts of Gujarat. Even ministers from the Patel community weren't spared in this spate of violence. At least three of them had their houses attacked by angry mobs. 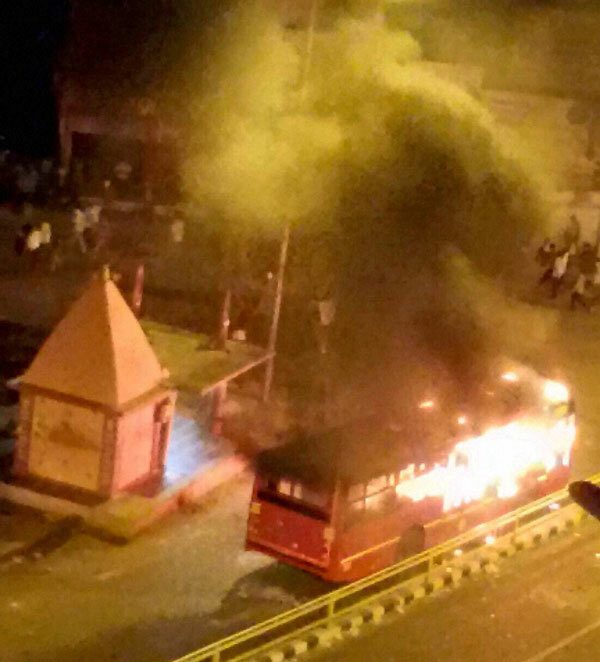 Other protestors clashed with the police as rumours of Hardik's 'arrest' spread like a forest fire across ths state. There were rumours that Hardik and other Patel leaders had been mercilessly beaten up in police custody, and that even two local photographers had been thrashed. In a bid to assuage frayed tempers, the police was forced to request television channels to show Hardik "safe" in the police custody. Hardik was detained after he began an indefinite fast at the venue of the rally, the GMDC grounds in posh western Ahmedabad. He insisted that the agitation would continue till Chief Minister Anandiben Patel personally came to the venue to receive their memorandum of demands. The police had been requesting Hardik to call off his fast and vacate the venue, as the permission for the rally was valid only up to 5pm. Late in the evening, it finally lost patience and rounded up the Samiti convenor and a handful of supporters. Earlier, during the rally, Hardik had thundered: "Only if our demands are met will the lotus bloom in the 2017 Assembly elections in Gujarat, or else, never again." He chose to speak in Hindi to say that: "We may be 1.8 crore in Gujarat, but nationally we are 27 crore. The Chief Minister of Bihar, Nitish Kumar, is from our community and so is Andhra Pradesh Chief Minister Chandrababu [Naidu]. In all, we have 117 Patidar Members of Parliament. This demonstrates our strength and reach." He said the Gurjars of Rajasthan, who had locked horns with their government over reservation benefits, had extended support to the Patels. "We are prepared to go to Gandhinagar and to Jantar Mantar in New Delhi if our demands are not met," he threatened. Hardik claimed 18 lakh people descended at the rally site, while official estimates put it at around 5 lakh, given the fact that the venue could not accommodate more 3.5 lakh. The government had earlier decided to ignore the demand and the 48-hour ultimatum served on the CM. It adopted a wait and watch policy. While it seemed overawed by the agitation, which has grown to a state-level movement, the government waived off toll tax for all vehicles en route and made its GMDC ground available for free. But during his speech, Hardik departed from the agreed script of the Ahmedabad district collector receiving the Patidars' charter of demands. Instead, he demanded that the chief minister herself must come to the venue to receive it. Until this happened, he and some of his colleagues would remain on fast at the venue. When Hardik, who recently completed his commerce graduation, made a turnaround from the agreed script, Anandiben went into an emergency huddle along with some of her cabinet colleagues, officials and advisers in the state capital. The government then hardened its stand. As night descended, the crowd had petered out to just a couple of thousand, and the police resorted to a lathi-charge to disperse them and take away the five fasting leaders. The city witnessed unprecedented security deployment, with the leave of all police personnel throughout the state being cancelled. Armed police as well as cops from all over the state were pulled into Ahmedabad for this rally, besides the Rapid Action Force. After stray incidents of violence, an assault on photojournalists by the cops as well as the agitators, and the demand for the presence of the CM at the venue, Border Security Force(BSF) personnel were deployed to beef up security at the ministerial residence enclave in Gandhinagar and other key points. Anticipating a mass of people converging on the city for the rally, normal life was thrown out of gear. Schools, colleges, offices and commercial establishments voluntarily kept their shutters closed. The government has set up a seven-member ministerial committee, led by senior Cabinet minister Nitin Patel, to hear the grievances of the Patels. But it has not yet bowed down to the agitation, which that threatens to trigger off a caste war in Gujarat. OBCs communities, as well as those from the Scheduled Castes and Scheduled Tribes, are bracing themselves to counter any move to include the Patels (the rich and landed Kadva and the Leuva Patels) in the reserved category, for it would split the quota.